Enlarged approx. 120 times, in SOMSO-Plast®. 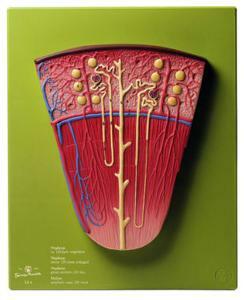 The model shows two nephrons with little knots of kidney, renal tubules and collecting tube system. In one piece. Mounted on a green board.